Each of these list-servers have different features, however they all have one thing in common... they're professional, proven, web-tested applications. There are FREE and PAID systems included in the following selection. Basically, it's a *horses for courses* approach. What do you need? What's your budget? TOPICA is a FREE ONline list-servers management system. It's an ideal place to start if you're just getting started. Also, it's a "hands-on" system. Apart from the automated subscribe/unsubscribe features, you "do it yourself." Ideal If You're Just Starting Out. SparkLIST is ideal for the high end user. It's the perfect solution for a webmaster with established (or multiple) lists who wants to outsource their list/s management to professionals. Again, it's a fully featured system. ProAutoResponder is DEFINATELY the best of the ONline autoresponder systems for list management. The reasons? Well, you just plain get so much value for your money with the PAR system. Highly Recommended Multi-Purpose List-Servers System. OPTinlightning is fully featured, automated, best-of-breed list management software with AR capability. OPTin is the idea solution if you want to manage your own list from your own desk top. Excellent If You Want Desk Top Control. -------->> T E S T I M O N I A L <<-------- As you say there's a lot of nonsense on the web. 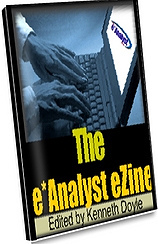 I just wanted to let you know just how much I enjoy reading The e*Analyst Ezine, because it's always full of such good, well written and informative material. It's obvious that you know your subject area.